A manual ice crusher comes in handy when creating cool refreshing beverages as it will turn ice cubes into small, manageable chunks that give cocktails just the right blend without watering them down. But what do you look for in the best manual ice crusher? We’ve put together a top 9 list of the best manual ice crushers chosen based on materials, ease of use, size, overall quality, and user opinions. Let’s take a look! If you are looking for a unique gift idea, the Metrokane Rabbit Ice Crusher is a great idea for the margarita and frozen daiquiri lover in your life. This is a hand-cranked ice crusher that will crush ice from either coarse to fine consistency. The top handle has a heavy-duty, sturdy construction, and the metal has a polished chrome finish. The Metrokane Rabbit easily crushes up to a quart of ice in two minutes. All the parts are easily washed by hand, and the Metrokane comes with a lifetime warranty on all its moving parts. Reviewers liked that it crushes a large amount of ice, it is sturdy and durable, and easy to store. Others disliked that it is heavy to lift, and it is somewhat hard to get started. It’s not the best manual ice crusher on this list if we look at its ratings and reviews, but it’s a reliable choice nonetheless. Another convenient and easy to use manual ice crusher from a German company, Cilio is great for indoor and outdoor use. 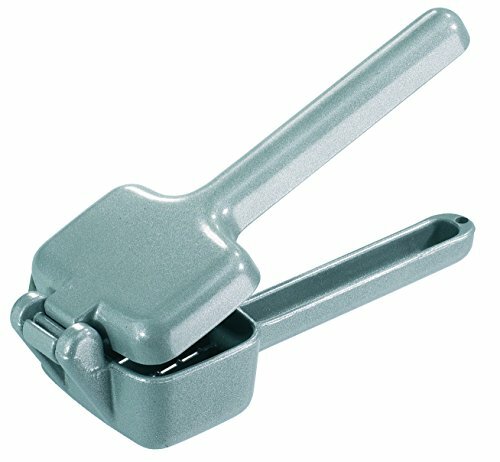 With the well-padded crank handle, you can comfortably crank ice at home, on your boat, or at a picnic. Its steel crushing blades are made of robust stainless steel guaranteeing long-term use. With its chromed metal housing, this machine will last a long time. The protective, non-slip feet keep it from moving while you use it, and, due to its small size, it is very easy to store and carry. Users loved the removable drawer and included ice scoop as well as how easy it was to use and store. Others disliked its sharp edges and some of its plastic flimsy parts. Note: If a heavy-duty ice crusher would fit your needs best but don’t want to invest in one, check out our list the best blenders for crushing ice! And if you’re a more traditional kind of gal or guy, you might also want to read our article on the best ice picks! 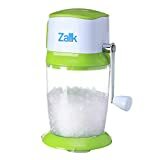 This affordable ice crusher from Zalik is perfect to take with you to at the beach, picnic, BBQ, or even to a party as it requires no electricity. With a capacity of 50 ounces, it’s all you really need for you and your friends. Its rustproof blades are durable and deliver great results. It can make both fine and coarse pieces of ice; simply turn the crank to the right or to the left depending on the desired result. 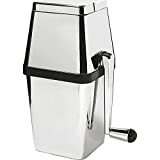 Not the cheapest option here but definitely a high-quality product, this manual ice crusher from Ufengke Kitchen is ideal for fans of stainless steel products. It measures 10.2 x 6.3 x 5.1 inches and has thick and sharp blades that are able to make all kinds of ice in a time-saving manner. The ice is crushed in as little as 20 seconds! Plus, you can also use this ice crusher to cut fruits. 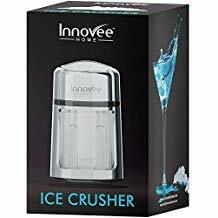 The Innovee Manual Ice Crusher is beautifully designed and is a great addition to any bar or kitchen. It includes a large capacity ice bucket and an ice spoon that lets you easily scoop the ice out. The Innovee grinds, cuts, and chops your ice to your preferred fineness level allowing you to make amazing drinks that look and taste great. It includes carbon stainless steel 430 blades that easily crush your ice every time you use it. Users like that it is simple to use, low maintenance, durable, and has a modern look. Others disliked that it doesn’t have suction to hold it to the counter and that it is hard for older people to turn. Even though it’s the second best manual ice crusher, it still is a reliable choice for home use. When you want fast and easy crushed ice, the Victorio Ice Crusher can quickly give you finely crushed or coarse ice for your favorite drinks. It comes in a compact size that is easy to store and use. The Victorio is a great addition to your bar or kitchen and comes with a five-year warranty.With stainless steel blades and a sturdy body, you can quickly crush up to four cups of crushed ice. Plus, the suction base keeps the Ice Crusher from moving while you are using it; this is, according to online ratings and reviews, the best manual ice crusher available for online purchase this year. 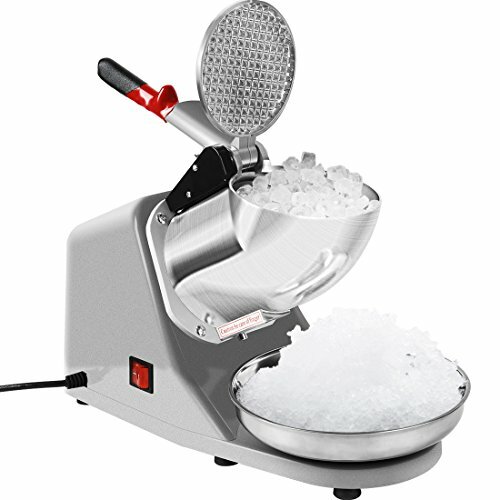 Reviewers loved that it was easy to use, creates a good supply of ice chips, and makes two different sizes of ice. Others disliked that it tends to rust if you don’t dry off the parts and that you have to have it on an area where the suction can hold it in place or it will move while you crank it. 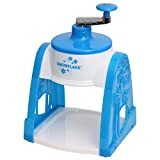 The Westmark ice crusher is made in Germany using high-quality heavy-cast aluminum and is the third best manual ice crusher on this list according to ratings and reviews from verified customers. Although it might not seem like it, this ice crusher has an ergonomic handle and requires very little effort to crush ice. In addition, it’s also dishwasher safe! The downside of this ice crusher is that it can only crush small amounts of ice at a time. Nevertheless, it’s a very reliable tool for small homes and intimate gatherings. 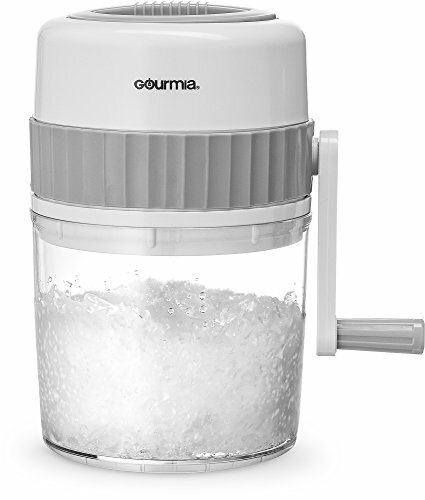 The Gourmia ice crusher is the second best manual ice crusher currently on the market according to ratings and reviews from verified customers. It comes with stainless steel blades that quickly and effectively crush the ice cubes without too much effort from your side. The rest of this device is made of plastic, but customer reviews mention it’s a long-lasting, durable ice crusher that works great for regular use. The absolute best manual ice crusher on our list comes from Viski and is comprised of a beachwood mallet and a high-quality canvas bag that can absorb water and dry out very quickly. 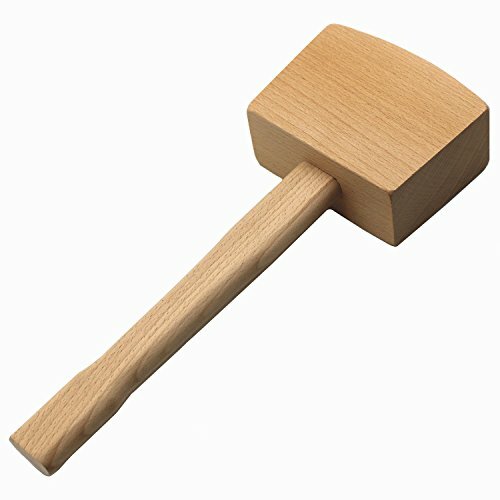 You simply need to drop the ice cubes into the canvas bag and pound them with the mallet until you reach the desired grain. This ice crusher’s design is based on the original Lewis bag used in the 19th century. 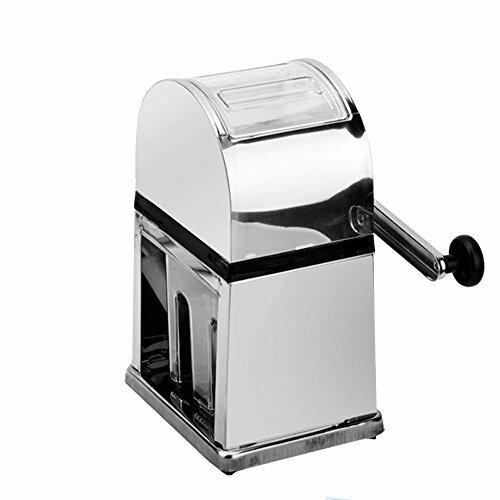 If you enjoy the convenience of having crushed ice whenever you want, purchasing a manual ice crusher is the way to go. One of these options will definitely be the best manual ice crusher that works for your needs. Did you agree with our top 9? Let us know in the comment section below! Scotsman Undercounter Essential Ice: Should you Buy it? 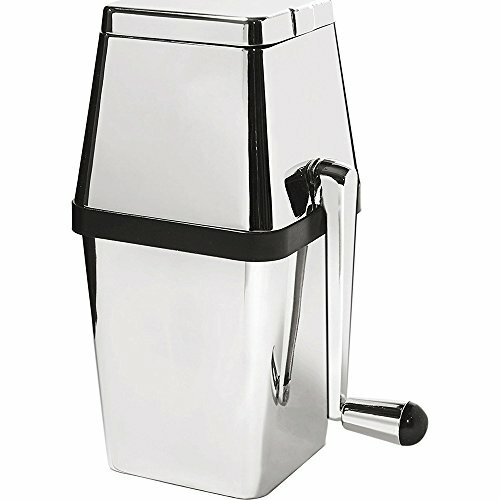 German companies have the reputation of making elite products, and even though I am still looking for the right manual ice crusher, I am leaning towards getting the Cilio Deluxe. We are searching for a manual ice maker that can be used indoors and outdoors. This one looks promising. Thank you for commenting, Richard! If you decide to buy any of the products on our list, please return and let us know your thoughts on that specific ice crusher. I have been told by guests in the past that my margaritas are fantastic, the ones I serve at my home parties several times a year. It’s not me who makes the best margaritas. The credit goes to the Metrokane Rabbit Ice Crusher. An awesome piece of equipment. Thanks for the feedback. We’re glad you had a nice experience. Zalik makes high-quality ice crushers and I really am happy with the one that I have had for a long time. Should I also add to the fact that it is long-lasting as that is definitely an important factor to take in? Thanks for sharing your experience. We’re happy you enjoy your manual ice crusher. And yes, we agree with the fact that a long-lasting product is a perfect investment. I was given the Metrokane Rabbit Ice Crusher for a housewarming gift last year, and let me tell you, this is the best ice crusher that I have ever used. I am so thrilled with how well it works and would not trade it. Hi, Annalise! Thank you for sharing your experience with this ice maker. 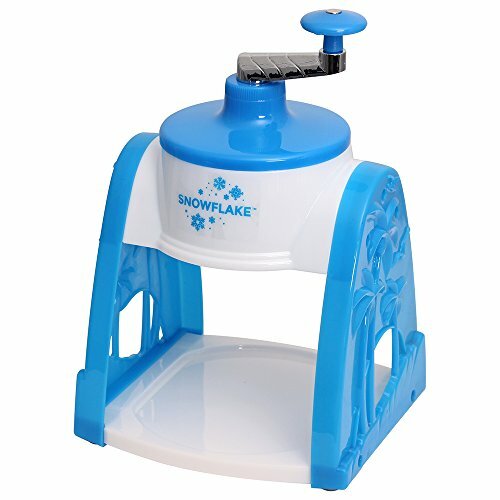 If you are having a large number of guests attending an event, then you are going to definitely want to purchase the Metrokane Rabbit ice crusher. The reason this is ideal for that is that it will crush a lot of ice at once, and that is highly convenient. Thank you for the input, Dan! Cilio is a German make and German products are always superior in my opinion. That said, this ice crusher is also superior over the others. What are your thoughts on that? I wonder if others would agree with me on this.